With Airfix going bust in the early part of the decade and Revell not to enter the plastic figure market until its end, the 1980s were a period when only one manufacturer really kept the hobby going, and that was Esci. 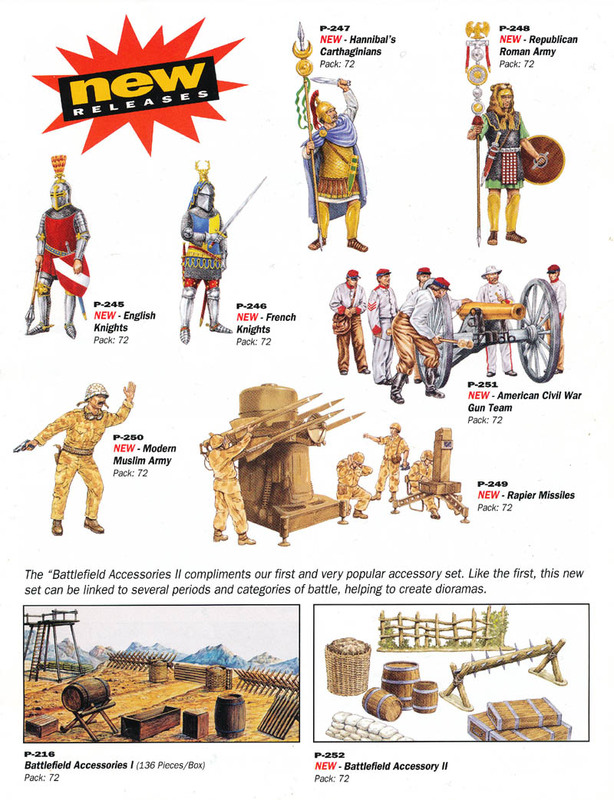 Having released their first soft plastic figure sets in 1982, they went on to produce several sets each year, with their 'modern' series (NATO and Warsaw Pact troops) appearing in 1989. Then in 1990 it all went quiet. The existing sets were still being made, but there was no mention of any new ones, and the same was true in 1991 and 1992. Esci had their own financial troubles, and it looked like they had finished with new figures. However their 1993 catalogue had a surprise - a whole page devoted to the many new sets they were preparing for the coming year, as well as a number of new kits for their range of aircraft. The page concerning their new figure sets is below, and very enticing it was too. It must be remembered that at the time there were relatively few figure sets on the market. Airfix had been the only other major producer in 1/72 scale, so everything here offered something new and exciting. No one had made Republican Romans or Carthaginians at this point, and the Airfix knights (in their Sheriff of Nottingham set) were pretty poor, so these four sets were breaking new ground. Equally, the Airfix set of American Civil War Artillery was not good quality, so a new set to match the Esci infantry sets made a lot of sense. With the Iraqi invasion of Kuwait still fresh in the memory, a set of 'Modern Muslim Army' seemed an obvious expansion on their existing modern US and NATO troops, and both the Rapier and new Accessory sets would doubtless come in handy too. Everything looked promising, but none of these sets appeared that year, and in their 1994 catalogue there was no mention of any of them. In fact, Esci never made another new set of plastic figures, so none of the above ever made it to market. Or did they? In fact what was happening was Esci were attempting to do a deal with the new company Accurate to market some of their new sets under their own name. Both the medieval sets and the American Civil War Gun Team were targeted by them, but in the end they lost out to Revell, who duly released all these Accurate sets in their own boxes as well as a number of others. Therefore, the medieval and civil war sets did eventually appear, but in Accurate and Revell boxes. Esci were planning to make the other sets themselves, but when the Accurate deal fell through they cancelled the rest. Of course time has moved on and in the following years the hobby grew enormously. Pride of place in that movement goes to HaT, who started producing good quality sets in large numbers. Amongst their early offerings were a number of sets for Republican Romans and Carthaginians, and these have since been expanded with sets from Italeri and Zvezda. No one has felt the need to make a 'Modern Muslim Army' at the time of writing (2012), despite further wars such as the invasion of Iraq in 2003. Caesar have made a number of militia sets, but to date a full set of Iraqi troops remains a gap in the hobby. So in the end we did get some of these sets, and other manufacturers have filled most of the gaps, though what the Esci sculptors would have made of these subjects we will never know.